New paper on active black holes affecting star formation rates! Good news everyone, another Galaxy Zoo paper was published today! This work was led by yours truly (Hi!) and looks at the impact that the central active black holes (active galactic nuclei; AGN) can have on the shape and star formation of their galaxy. It’s available here on astro-ph: http://arxiv.org/abs/1609.00023 and will soon be published in MNRAS. Turns out, despite the fact that these supermassive black holes are TINY in comparison to their galaxy (300 light years across as opposed to 100,000 light years!) we see that within a population of these AGN galaxies the star formation rates have been recently and rapidly decreased. In a control sample of galaxies that don’t currently have an AGN in their centre, we don’t see the same thing happening. This phenomenon has been seen before in individual galaxies and predicted by simulations but this is the first time its been statistically shown to be happening within a large population. 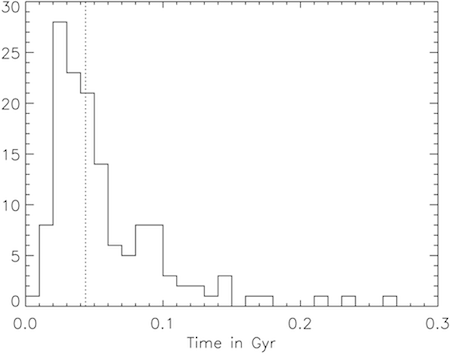 It’s tempting to say then that it’s the AGN that is directly causing this drop in the star formation rate (maybe because the energy thrown out by the active black hole blasts out or heats the gas needed to fuel star formation) but with the data we have we can’t say for definite if the AGN are the cause. It could be that this drop in star formation is being caused by another means entirely, which also coincidentally turns on an AGN in a galaxy. A random sample of galaxies which host a central active black hole used in this work. 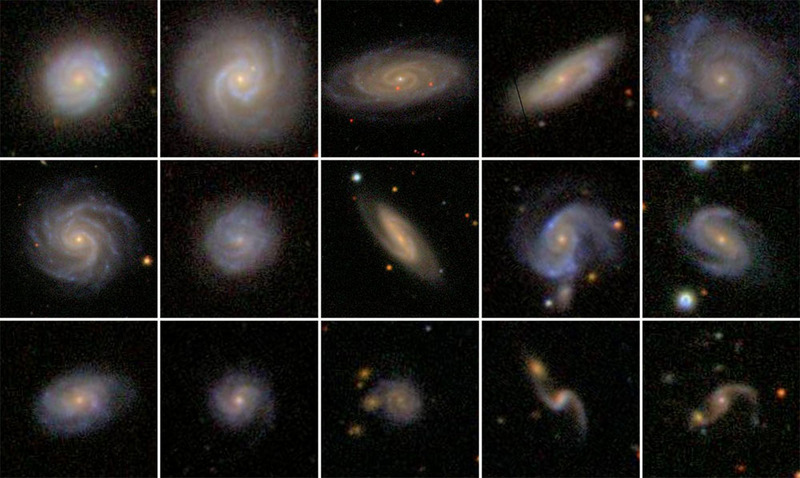 The disc vote fraction classification from Galaxy Zoo 2 is shown for each image. Images from SDSS. These galaxies were also all classified by our wonderful volunteers in Galaxy Zoo 2 which meant that we could also look whether this drop in the star formation rate was dependent on the morphology of the galaxy; turns out not so much! 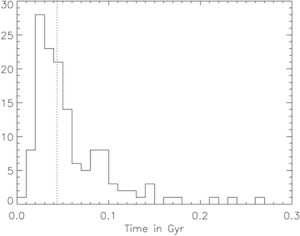 If the drop in the star formation rate is being caused directly by the AGN (and remember we still can’t say for sure!) then the central black hole of a galaxy doesn’t care what shape galaxy it’s in. An AGN will affect all galaxies, regardless of morphology, just the same. 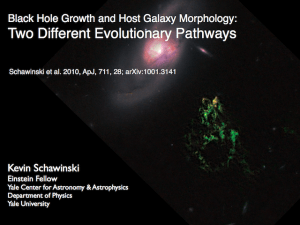 First Radio Galaxy Zoo paper has been accepted! The first Radio Galaxy Zoo paper has been accepted by the Monthly Notices of the Royal Astronomical Society (MNRAS) and is available today on astro-ph. The paper entitled “Radio Galaxy Zoo: host galaxies and radio morphologies derived from visual inspection” outlines the project and provides the first look into some of the science that has come from Radio Galaxy Zoo. Fig. 1. 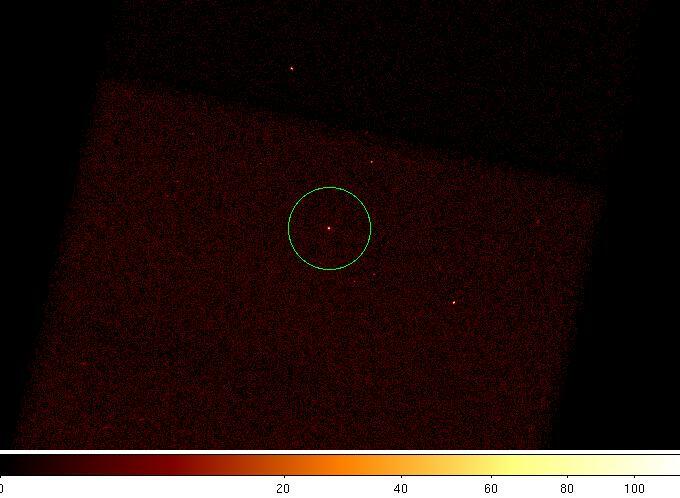 An example of a galaxy where visual identification of the radio components is necessary. the automated algorithms would have classified the non-core emission as independent sources, whereas RGZ volunteers (in agreement with the science team) find all five radio emission components in the upper half of the image to be related to the same source. Fig. 2. 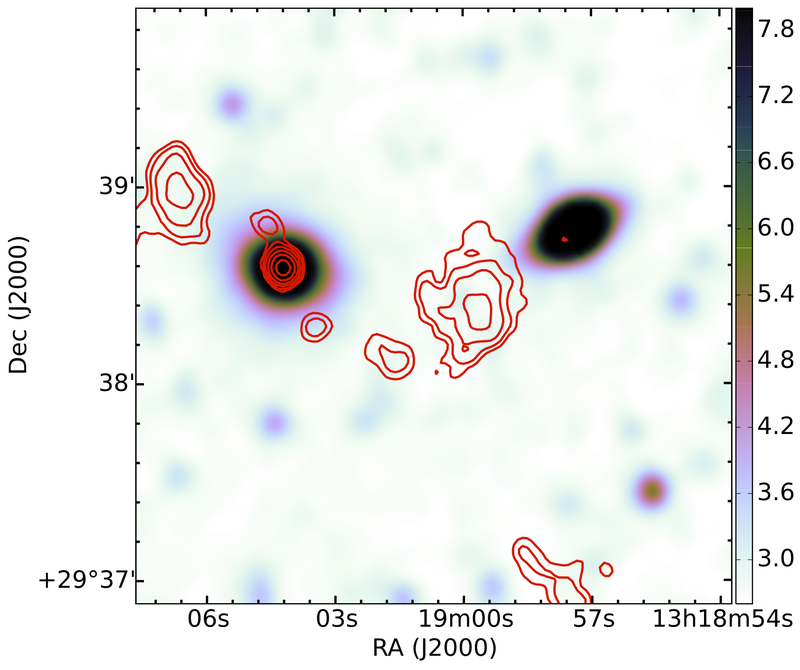 (a) WISE colour-colour diagram showing approximately 100,000 WISE all-sky sources (colourmap), 4614 RGZ sources (black contours), and powerful radio galaxies (green points). (b) WISE colour-colour diagram showing the locations of various classes of astrophysical objects from Wright et al. (2010). Using the classifications of the WISE infrared host galaxies, we find that the majority of the host galaxies are located in the WISE colour space consisting of elliptical galaxies, quasi-stellar objects (QSOs), and luminous infrared radio galaxies (LIRGs) – see Fig. 2. Upon closer examination of the RGZ objects that are identified as elliptical galaxies in the WISE W1-W2< 0.5 colour space we note that our current sample shows a possible large population of star-forming galaxies and/or ellipticals with enhanced dust – see Fig. 3. Fig. 3. Distribution of (W2 – W3) infrared colours for objects near the region identified as elliptical galaxies (W1 – W2) < 0.5. Solid and dashed vertical lines show the median colours of the all-sky and RGZ sources. 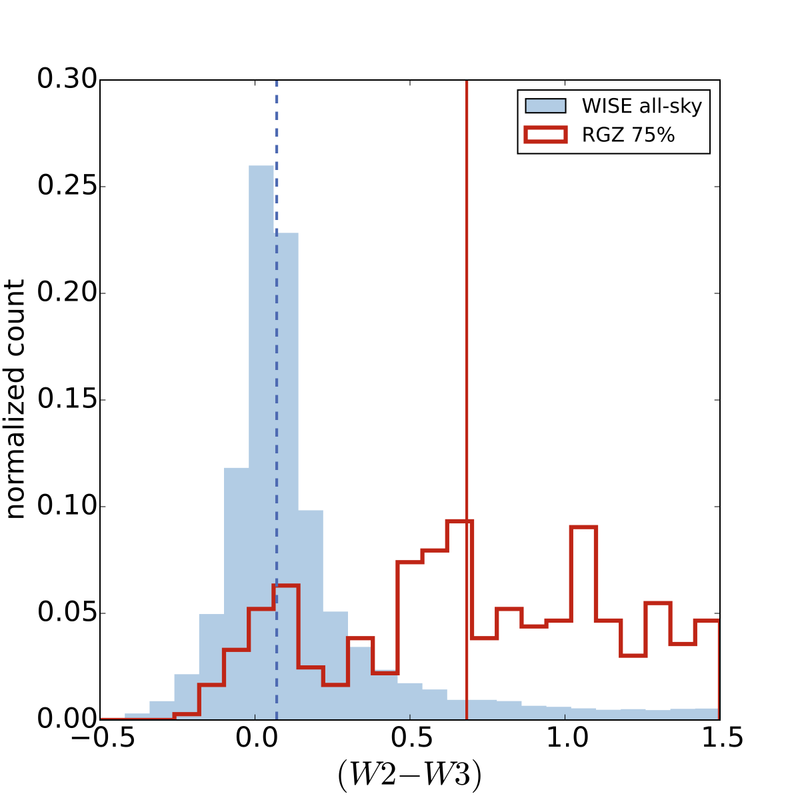 While sources randomly selected from the WISE all-sky sample peak near (W2 – W3) = 0, our current RGZ sample shows a large population with significantly redder colours – possibly from star-forming galaxies and/or ellipticals with enhanced dust. We still have a lot of radio sources in our project that need classification and we hope to continue the great work from all our citizen scientists and science team. Don’t forget to head over to Radio Talk for interesting discussions on objects or some of the science in general. Thank you once again for your hard work and support throughout the first years of Radio Galaxy Zoo! Longtime readers of the Galaxy Zoo blog will be familiar with the peer review process from the many posts here describing it. The time elapsed between a paper’s submission and its acceptance (if it is accepted) can be long or short, and papers from the Zoo have sampled the whole spectrum. The process with our paper on supermassive black holes growing in bulgeless galaxies took about 4 months: we submitted the paper in July, received comments and suggestions from the anonymous referee in August, then modified the paper based on the referee’s report and re-submitted it in October. This week, the paper was accepted by MNRAS. The initial report from the referee was extremely thorough and constructive, and incorporating his/her comments helped to significantly improve the paper. The referee pointed out, for example, that although the paper emphasized the lack of significant mergers in the evolutionary histories of the sample, the bulgeless nature of the sample excludes not just mergers but any violent evolutionary process that can disrupt a disk to the point where it transfers a significant fraction of its stars from a disk into a bulge or pseudobulge. That was certainly a fair point, so we changed our discussion to include further consideration of the implications of those evolutionary processes being excluded. And we made some other changes, too, including expanded discussion of why our results differ from some other studies and additional description of how we might be affected by dust in these galaxies (and why we think we aren’t). There were also some very interesting questions that we couldn’t really answer within the scope of this paper, but that we had asked ourselves too and that have already formed the basis for additional projects now underway. Overall, this was a classic example of what the peer review process was meant to be. The accepted version of the paper will soon be available on the arXiv for anyone to download. In the spirit of openness, I had hoped to include the referee’s report and our response in the additional materials on the arXiv, but the referee did not give permission to do so. That’s fine — it’s anonymous and it’s perfectly acceptable if the referee prefers the exact contents of the report to be private as well. Hopefully he/she approves of my summary! Note: as soon as it’s published, the paper will also be added to the Zooniverse Publications page, which coincidentally happens to have been released today as the first day of the Zooniverse Advent calendar. Have a look — Galaxy Zoo’s contributions are impressive and we’re joined by many, many others. Galaxies are often a bit of a hot mess. Not only are the stars, gas and dust within a galaxy all coalescing and expanding, heating and cooling, absorbing and emitting, but this whole system is embedded within a halo of dark matter that interacts only via gravity, a force acting on scales big and small, from that huge halo to the relatively compact central supermassive black hole. As these various parts of a galaxy combine in some proportion to drive its evolution, galaxies also merge with others to form larger galaxies, which of course changes the evolution of the resultant system. It’s all extremely beautiful, as you know, but it makes studying them complicated. For example, the question of how supermassive black holes and galaxies seem to co-evolve is fundamental to the field of galaxy evolution, but it’s very difficult to separate how much of this co-evolution is due to mergers and how much comes from non-merger processes. Happily, Galaxy Zoo is in an excellent position to help answer this question. Galaxy Zoo classifications have already helped us understand the role of mergers in the evolution of galaxies (also see previous blog posts related to mergers). Recently, I’ve been working on a project that approaches this question from the other side: what part of the growth of galaxies and black holes happens in the absence of mergers? Mergers leave behind clear signatures on a galaxy’s morphology. Even long after the tidal tails and stellar streams of an ongoing or recent merger have faded away, the effect of a merger can be seen in the strength of the galactic bulge, the collection of stars on disordered orbits very different from the ordered rotation of a disk. Simulations show that at least some of the stars from a disk are re-distributed into a bulge during a merger (how many stars depends on the kind of merger). Most of those simulations show that even mergers where a big galaxy gobbles up a galaxy only a tenth of its mass will form a bulge. In other words, significant mergers inevitably lead to the formation of a bulge. Pure disk galaxies without bulges, therefore, have had a merger-free history. And if we want to also study the growth of black holes in these galaxies, we need to find bulgeless galaxies that host active galactic nuclei, supermassive black holes that are actively being fed with surrounding material. Chris and I started this project several months ago, and many other members of the team joined in. The first time we looked in the Sloan data from Galaxy Zoo 2, we didn’t find any galaxies that were both classified as bulgeless and had clear spectral evidence of an AGN. Fifteen may not seem like many, but bulgeless galaxies are thought to be quite rare, and only a small percentage of galaxies has an actively growing black hole, so it’s pretty impressive to find even that many when we’re looking for a rare subset of a rare subset of galaxies. We also have data on the growing black hole: two of them have enough information that we can calculate the black hole mass, and for the others we can use their luminosity to estimate the lowest mass that the black hole could possibly have (any lower and it would be overfeeding). It turns out that the black holes can grow pretty big: one of the two we know the masses for is about 10 million times the mass of the Sun, and the other is almost that big. The lower limits on the other black hole masses all suggest the black holes are similarly massive: given that we believe these are systems that have evolved in the absence of significant mergers, this tells us that black holes can grow pretty large without any of the black hole feeding that occurs when two galaxies collide. The black holes also don’t seem to be related to the bulges (or lack thereof) in the same way as most galaxies with measured black hole masses, which may hint that the observed relationship between bulges and black holes is not a fundamental correlation, but rather something that only occurs when there’s enough of a bulge present that the bulge traces the gravity of the whole (or nearly the whole) system. In other words, maybe bulges don’t have a special relationship with black holes: maybe the relationship is between the black hole and the total content of the galaxy, which is often (but not always, and not with our sample) traced by the bulge. We have submitted the paper presenting these findings, and had our first set of comments from the referee. The comments were positive overall, as well as being very helpful and detailed, so we’re working on incorporating those suggestions and I’ll keep you posted on the paper’s progress. But the project would not have been possible without Galaxy Zoo: your classifications are helping us learn about not just galaxies but the central supermassive black holes that live within them. 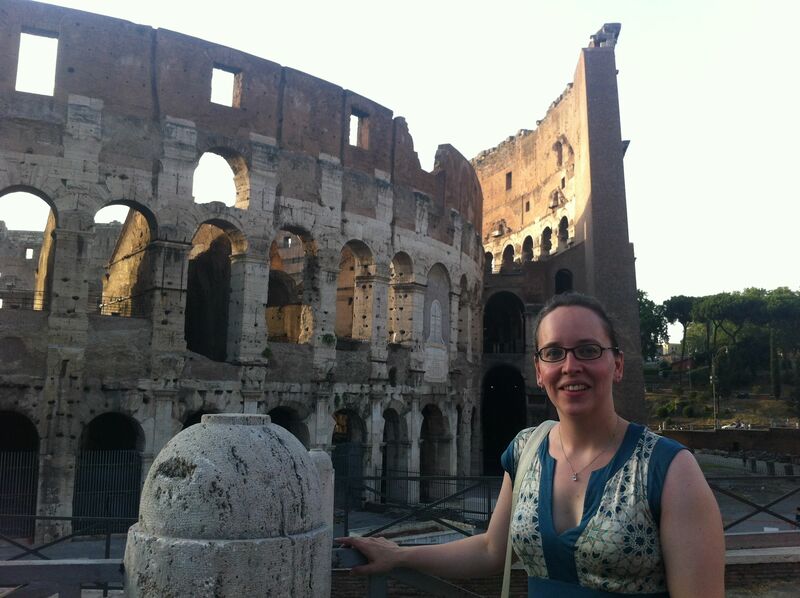 This post is part of Citizen Science September at the Zooniverse. 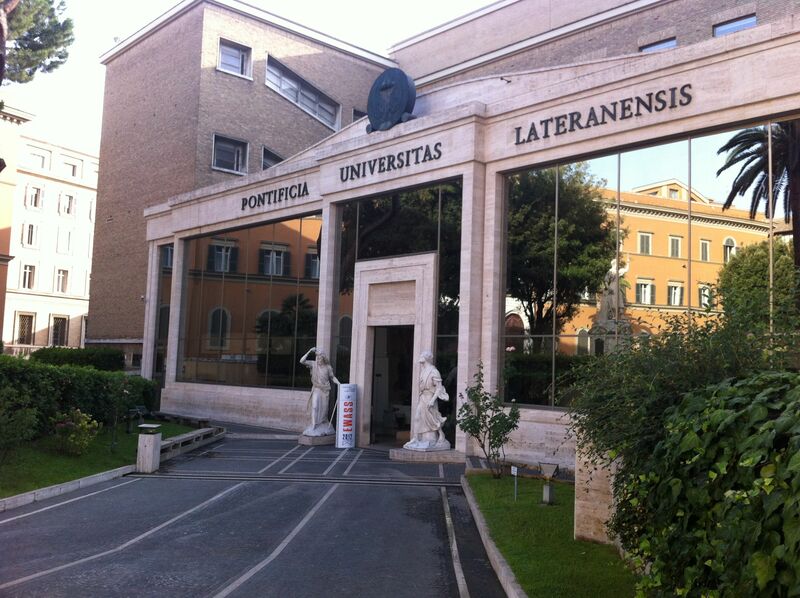 The Galaxy Zoo science team is well represented this week at the annual European Week of Astronomy and Space Science, hosted this year at the Pope’s University (or more properly Pontifica Universita Laternase) in Rome, Italy. A session on the first day on the Structure of Galactic Discs perhaps explains the interest of many of us on the Galaxy Zoo team. 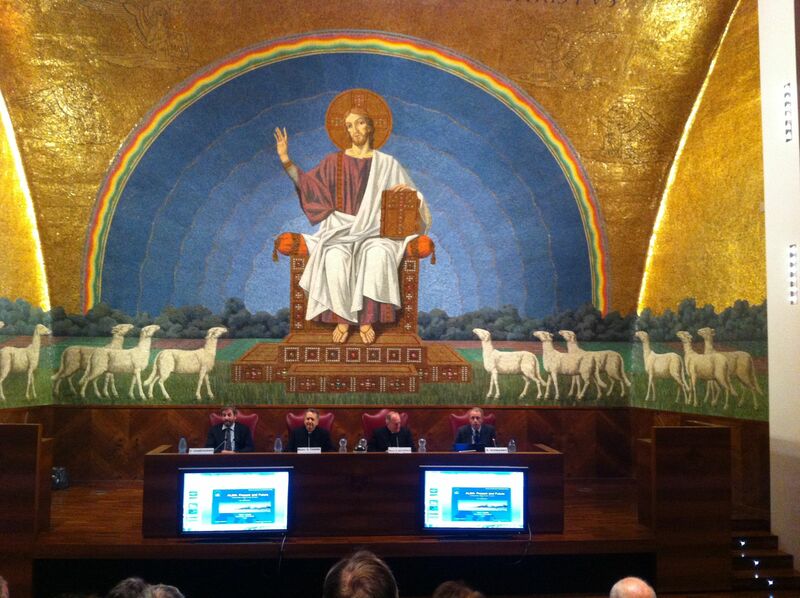 I spoke in that session on my recent results looking at bars and the atomic gas content of nearby galaxies. 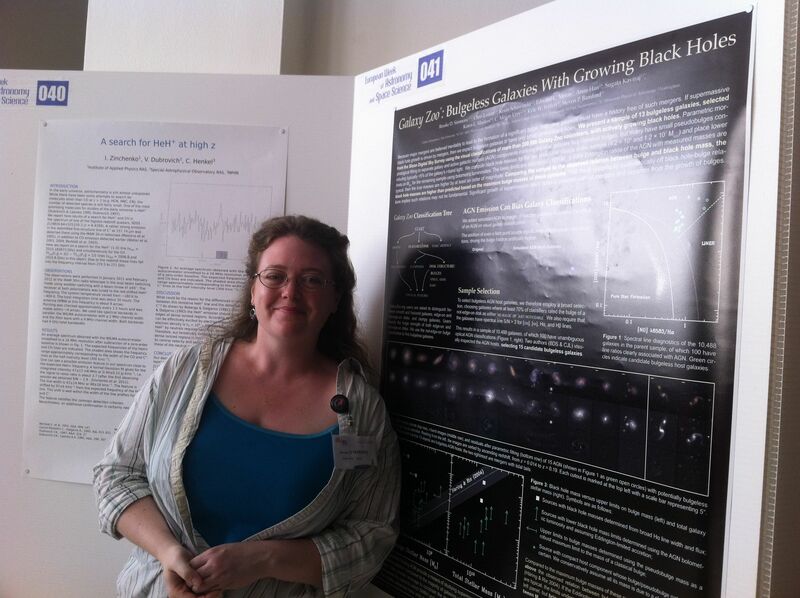 Brooke Simmons (now settling in as a new postdoc at Oxford after finishing her PhD at Yale recently) had a poster on some work I’m sure you’ll hear about soon about some very interesting totally bulge free disc galaxies which still have actively growing supermassive black holes in their centres. 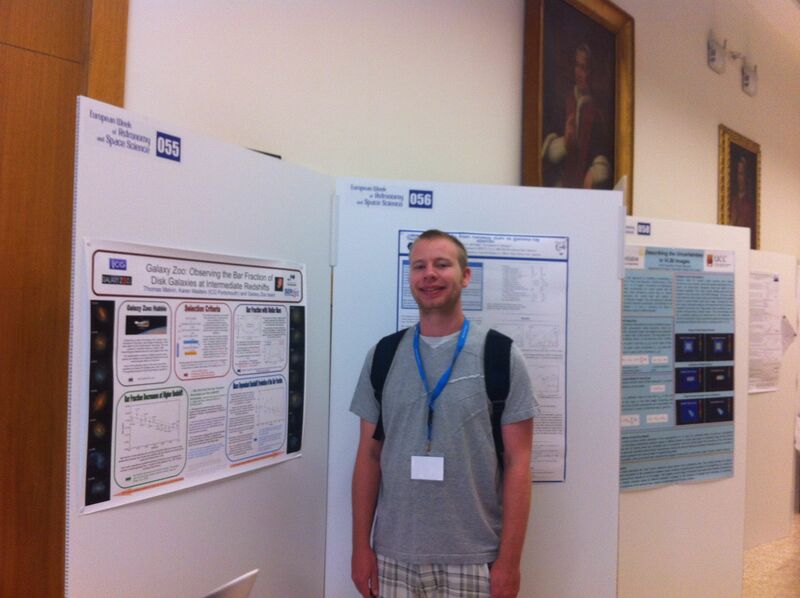 And Portsmouth PhD student, Tom Melvin (who is working with me) had a poster on his work using Galaxy Zoo: Hubble data to look at the redshift evolution of the bar fraction (more on that very soon too I hope). Finally, talking in the session on interacting galaxies which runs tomorrow will be Kevin Casteels from Barcelona (who we all must congratulate on his very recent PhD) who has been working mostly with Steven Bamford on morphological signatures of closely interacting pairs of galaxies (arxiv link to paper, a blog post has been promised). 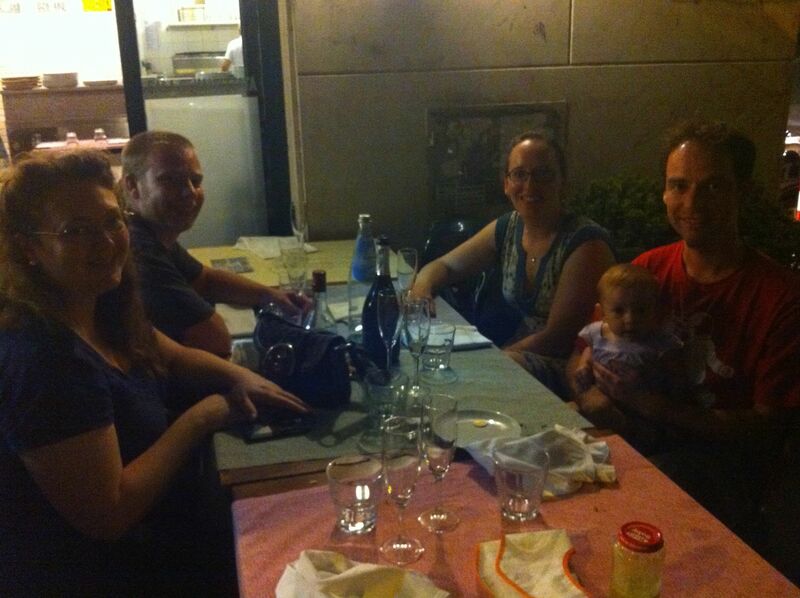 We all had a lovely (and typically late Italian) dinner together on Monday night – along with a Galaxy Zoo baby: Alia (Kevin’s daughter). New Dataset from Galaxy Zoo! This sample is presented in the Galaxy Zoo 1 paper on AGN host galaxies (Schawinski et al., 2010, ApJ, 711, 284). It is a volume-limited sample of galaxies (0.02 < z < 0.05, M_z < -19.5 AB) with emission line classifications, stellar masses, velocity dispersions and GZ1 morphological classifications. When using this sample, please cite Schawinski et al. 2010 and Lintott et al. 2008, 2011. Looking at our galaxies in the infrared allows us to discover the overall star-formation rate of the system. Yet if we are interested in the fine details of what really fuel the energetic output of our mergers we need to have a closer look to the light we get from them. Using a emission lines comparison technique called BPT (after Baldwin & Phillips & Terlevich 1981) we can tell what is really going on at the core of our galaxies. TV News says we don’t see any significant difference between the general IRAS-detected and the Luminous infrared galaxies. However, when we look at the most luminous infrared galaxies, the ULIRGs the fraction of AGN rises dramatically. This result is important because it conforms to many other studies on the role of AGN in ULIRGs. We also explore the timescale for a LIRG to become a ULIRG. This is obviously an imperfect analysis for various reasons: firstly not all LIRGs turn into ULIRGs, secondly we use Newtonian mechanics in our calculations and lastly our constraints are quite approximate. We assume that the Infrared luminosity peaks when the two galaxies coalesce, so we discard all the post-merger LIRGs. Another requirement is that the total mass of the progenitor system is less than the mass of the ULIRGs. We calculate the distance between the two cores and we used a typical group velocity of 400km/s. Under those conditions we find a timescale of 50 million years. X-ray observations of IC 2497 in the can! 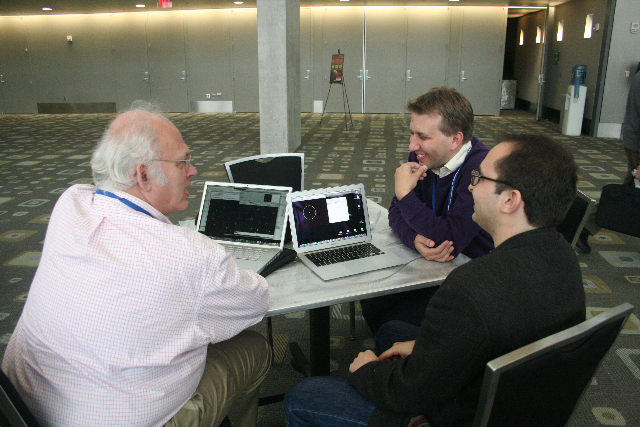 As we tweeted about and as Chris noted in his blog post about the Zooniverse success at the American Astronomical Society meeting in Austin TX, half of the Chandra X-ray observations of IC 2497 (the galaxy next to Hanny’s Voorwerp) have been executed and so with bated breath we awaited the results. From previous X-ray observations with Suzaku and XMM, we know that the quasar that lit up Hanny’s Voorwerp is dead, and that there’s just a weak source in the center of IC 2497 where the black hole lives and some evidence for hot gas. So we had turned to Chandra to figure out what was going on in the center of IC 2497. To puzzle apart the faint black hole at the center and the gas around, and Chandra has the sharpest X-ray eyes in the sky. We got the notification from the Chandra X-ray Center that the observations had concluded and that we could have a preview of the raw frame. Bill and Chris happened to be near, so after Chris finished his talk on the latest Planethunters.org results (two new planets! 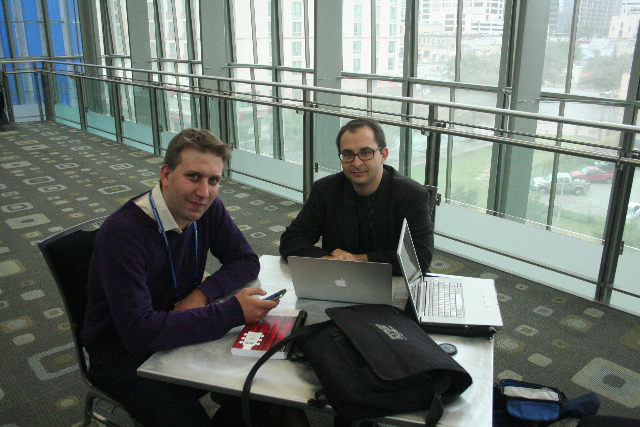 ), we got together in (possibly) the exact same spot where Chris and Bill viewed the first spectrum of the Voowerp at another AAS meeting in Austin four years ago. From left to right: Bill, Kevin, Chris, all looking at the data. Well that’s a bit underwhelming! First, we know that we have a bright source, so we can study the X-ray data in detail. Also, this is just a JPEG screenshot, so we can’t even zoom in and change the scaling to see if there’s anything else there. We don’t even know which way is North, so we don’t know where the Voorwerp is. So for now, all we can do is wait for the actual raw data to be available. This should take a few days. Stay tuned….! Chandra time for IC 2497 and the Voorwerp! 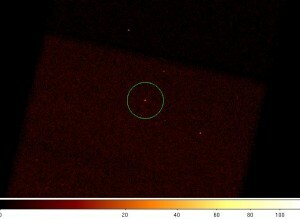 The list of approved targets for Cycle 13 of the Chandra X-ray Observatory is out and on it is our friend IC 2497. We were awarded 114 ksec (almost 32 hours) of time to point Chandra at IC 2497 and peer into its center. What do we want to learn? First, we want to see if the wimpy signal from the central black hole comes more into focus. Chandra has much better spatial resolution than XMM so we will be able to resolve the very center. We also want to see if there is any impact of the ex-quasar on the surrounding hot gas in the galaxy center. Did the quasar blow bubbles into the gas? Did it start doing so when it “switched state”? Unfortunately we won’t know for quite a while as Cycle 13 only starts later this year and will go on into 2012. So, stay tuned! You can get the whole talk as a PDF or as a Quicktime movie.